Get ready for a full day of sightseeing on the next day: take in the architecture and atmosphere at Kaplnka svateho Michala, contemplate in the serene atmosphere at Cathedral of St. Elizabeth (Dom svatej Alzbety), then admire the local landmark of Singing fountain, and finally appreciate the extensive heritage of Kosice Historical Centre. To see maps, where to stay, and more tourist information, refer to the Kosice road trip planner . Tel Aviv, Israel to Kosice is an approximately 9.5-hour flight. The time zone changes from Israel Standard Time (IST) to Central European Time (CET), which is usually a -1 hour difference. Expect little chillier weather when traveling from Tel Aviv in August: highs in Kosice hover around 31°C, while lows dip to 17°C. Wrap up your sightseeing on the 6th (Tue) to allow time to drive to Liptovsky Mikulas. A town in the Liptov Basin near the Tatra Mountains, Liptovsky Mikulas boasts a rich cultural and natural history. Start off your visit on the 7th (Wed): explore the historical opulence of Orava Castle, explore the fascinating underground world of Demanovska Cave of Liberty, and then admire nature's wide array of creatures at Zoo Kontakt. Here are some ideas for day two: make a splash at Aquapark Tatralandia and then contemplate the waterfront views at Strbske Pleso Lake. To find maps, other places to visit, photos, and tourist information, go to the Liptovsky Mikulas trip itinerary planning website . Getting from Kosice to Liptovsky Mikulas by car takes about 2 hours. Other options: take a train; or take a bus. Traveling from Kosice in August, expect Liptovsky Mikulas to be little chillier, temps between 28°C and 11°C. Finish your sightseeing early on the 8th (Thu) to allow enough time to drive to Banska Stiavnica. Banská Štiavnica is a town in central Slovakia, in the middle of an immense caldera created by the collapse of an ancient volcano. Start off your visit on the 9th (Fri): explore the historical opulence of Old Castle Banska Stiavnica, appreciate the history behind Statue of the Virgin Mary, then make a trip to Trojan pillar, then explore the historical opulence of Old town area of Banska Stiavnica, and finally contemplate in the serene atmosphere at Kalvaria. To find ratings, traveler tips, where to stay, and tourist information, refer to the Banska Stiavnica trip planner . Traveling by car from Liptovsky Mikulas to Banska Stiavnica takes 2 hours. Alternatively, you can take a bus; or do a combination of bus and train. Finish your sightseeing early on the 9th (Fri) to allow enough time to drive to Trencin. Trenčín is a city in western Slovakia of the central Váh River valley near the Czech border, around 120km from Bratislava. Start off your visit on the 10th (Sat): get to know the fascinating history of Parish Stairway, admire the landmark architecture of Mestska veza, pause for some serene contemplation at Evanjelicky kostol, then take in the spiritual surroundings of Piarist Church of St. Francis Xavier, then contemplate the long history of Katov dom, and finally explore the historical opulence of Trencin Castle. 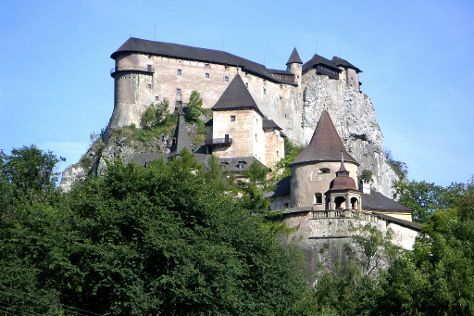 To find photos, other places to visit, ratings, and other tourist information, read our Trencin trip itinerary planner . Traveling by car from Banska Stiavnica to Trencin takes 2 hours. Alternatively, you can do a combination of taxi and bus; or take a train. Finish your sightseeing early on the 10th (Sat) so you can drive to Bratislava. You'll explore the less-touristy side of things at Room Escape Games and Nedbalka Gallery. Visit Devin Castle (hrad) and Bratislava Old Town for their historical value. And it doesn't end there: kick back and relax at Magio Beach, steep yourself in history at Primates' Palace (Primacialny palac), appreciate the history behind Cumil, and step into the grandiose world of Bratislava Castle. For traveler tips, other places to visit, ratings, and more tourist information, refer to the Bratislava travel route planner . You can drive from Trencin to Bratislava in 1.5 hours. Alternatively, you can take a train; or take a bus. Expect a daytime high around 32°C in August, and nighttime lows around 18°C. Wrap up your sightseeing on the 14th (Wed) to allow time to travel back home.